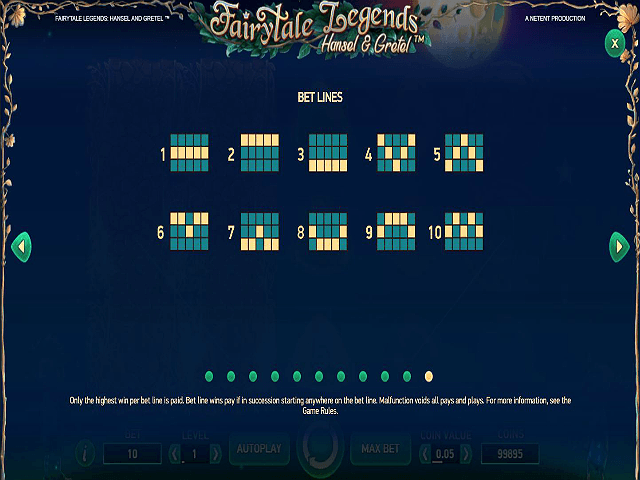 Fairytale Legends: Hansel & Gretel online slot is a magical 5-reel, 10 payline game created by NetEnt. 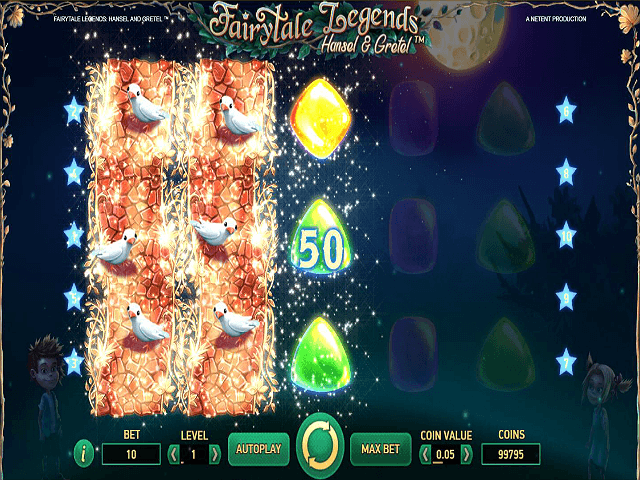 It is part of the Fairytale Legends series that reimagines classic stories as fun and thrilling slots. Read through our Fairytale Legends: Hansel & Gretel guide to find the best path through the woods to maximise your bet. 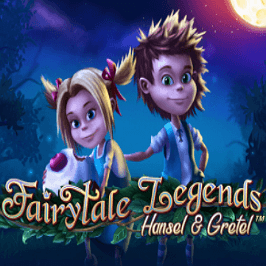 Play Fairytale Legends: Hansel and Gretel for Real Money! Software provider NetEnt has taken classic characters created by The Brothers Grimm and given them a glossy makeover in Fairytale Legends: Hansel & Gretel. The slot follows the well-spun story of two siblings who leave breadcrumbs to find their way home, only to find birds have eaten their path home. Hungry and lost, they stumble across a house made of gingerbread, inhabited by an evil witch who kidnaps them. They manage to trap her in the oven, and make off with her riches. This gorgeous 3D spinner offers a bright, vibrant spin on the original tale. A glowing full moon shines down on the two siblings, who stand at either side of the playing reels. The icons on the reel take the forms of different coloured candy that adorn the walls of the gingerbread house. In addition to a tempting return-to-player (RTP) rate of 96.7%, this game offers plenty of bonuses including a free spins round. 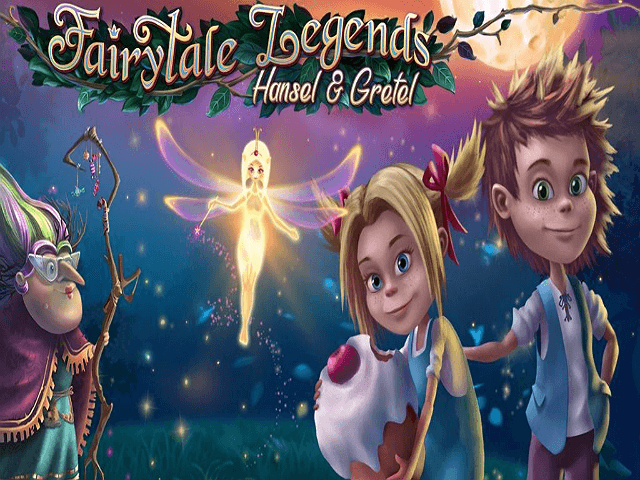 Fairytale Legends: Hansel & Gretel slot game features a tuck shop load of bonuses, with lots of bonuses and special features waiting to be won. The first of these is the Treasure Chest bonus, which offers one of three rewards. If you are lucky enough to land the treasure chest icon anywhere on reels one, three, and five, you will activate the bonus. 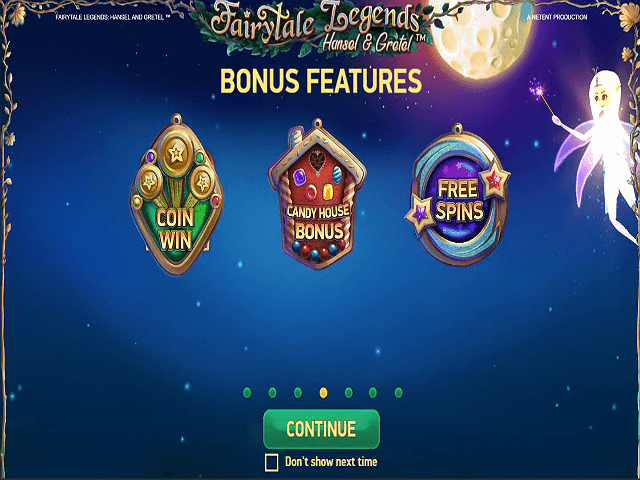 Players are urged to pick one of the chests, which can reward you with a coin win of 15 times the original wager, ten free spins, or the Candy House Bonus. The Candy House bonus in Fairytale Legends: Hansel & Gretel slot game spreads different coloured candies across the reels. You need to pick three in order to reveal a multiplier award, anywhere up to 120 times the bet. The game allows you to pick one prize and stick with it, or take an average of your three choices. The Stacked Wild takes the form of a stone pathway cutting through the reels, and initially appear on either reels two or four. If you manage to land the stacked reel, you earn a wild respin, with the original stack remaining fixed in position. Players could potentially land another stacked wild during the respin, on any reel except the central one. There are also three Random Features starring a magical fairy who flutters around on the opening screes, offering yet more ways to win. The Fairy Wonder Spin conjures up a series of the game’s logy symbols on the first three reels, upping the chances of a big-scoring payline. The second random event is the Fairy Surprise, which can appear after a spin without a win. One symbol will be chosen, and other symbols, starting with the lowest scoring, enchantingly transform into that same symbol, until it creates a winning line. The last of these is the Fairy Wild Spin, which works in a similar way to the Stacked Wilds. With the Fairy Wilds, two stacks can appear on any reel bar the middle one, practically guaranteeing a win. Once the spin has paid out, another free spin is rewarded. Share this Fairytale Legends: Hansel and Gretel Review today! If you like Fairytale Legends: Hansel and Gretel, you'll love these slot titles too!